If you look at the ingredient list of a Nutrageous bar, you’ll notice that peanuts come first. This is a very nutty bar, akin to a Snickers in terms of peanut density, with a smooth layer of caramel in place to add a nice touch of chewiness to the peanuts’ crunch. The base of the bar is, of course, the thick layer of Reese’s peanut butter, which holds everything together under a smooth and creamy layer of milk chocolate. The bar is a sensory delight: you have crunchiness, creaminess, chewiness, sweetness, and saltiness all in one bite, which is a lovely thing. Earlier this year, Reese’s introduced their Select Clusters, a candy with a similar composition as the Nutrageous: chocolate, caramel, and peanuts. The Select Clusters also have pecans, though I noted in my review that the nut element of the Clusters was lacking, and that the Nutrageous bar was, in fact, more cluster-like than the Clusters themselves. I stand by it: the Nutrageous bar already is everything the Clusters should have been. It’s dense, chewy, gooey, crunchy, and awesome. I’ve noticed that it’s getting harder to track down a Nutrageous bar – I finally got my hands on a Halloween snack-size bag in order to do this review, as I can’t seem to find the bars anywhere around here – and I’m worried that Reese’s might be phasing the Nutrageous out in favor of some of their new candies, which would be a shame, really, as the Nutrageous is one of the strongest candies in their Super Awesome Peanut Butter Arsenal. According to the book “Developing New Food Products for a Changing Marketplace” by Aaron L. Brody and John B. Lord, the Nutrageous bar was originally called the “Acclaim,” but kids didn’t connect with the name, so the bar was branded “Nutrageous” instead. I personally have no problem with the name – I think it’s silly and fun (which, as everyone knows, is the ultimate point of candy), but some critics feel that Acclaim would have been a better choice. In the end, it doesn’t really matter what you call the bar, as long as it’s delicious – and in Nutrageous’ case, delicious is an understatement. I love Nutrageous too and I agree that they’re getting harder & harder to find. I sometimes have luck at gas stations where you can pick up the king size bar. Still I wish they were available at the grocery store checkouts. They are still available at most of the grocery stores and drug stores in southwest Michigan. I love Nutrageous almost as much as Reese’s sticks, but not as much as the classic peanut butter cup (minis are my absolute favorite). wow. i had no idea these were so good. we always stick to the original reese’s pbc, thinking that there couldn’t possible be anything better, especially considering how disappointing the whipps and the crunch were. i must try this one! thanks for the info. 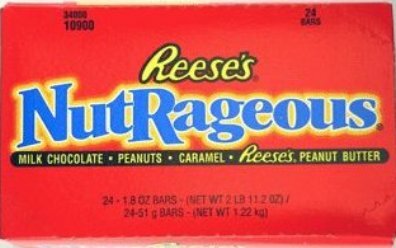 Out of all of the candy bars out there, Nutrageous just doesn’t do it for me. Take 5 surprised me with its goodness, but everytime I try a Nutrageous, I am left kind of… full but unsatisfied. I guess, it doesn’t make my tastebuds sing. Maybe I need to make sure they are fresher. That sounds flippin’ fantasic! Maybe it’s because I’ve spent my whole life in Burlington, WI, home of Nestles, but I’ve never even heard of a Nutrageous bar. From your review, it seems that’s quite a shame. I’m with AntFan on this one. I was surprised and delighted by Take 5 (Pretzels? Genius! ), but Nutrageous always feels…lacking somehow. Maybe I just don’t get the whole peanuts thing. I mean, I love love love Reese’s Peanut Butter anything generally, but the overwhelming presence of peanuts takes away from the experience for me. This is probably why I’m not a huge fan of Baby Ruth either. Snickers is probably the ideal peanut to chocolate/caramel/nougat/whatever ratio for me. I loved Nutrageous when I was a kid, so when I saw one at a local convenience store, I just had to pick one up. Unfortunately, it wasn’t near as good as I remembered it. I have a habit of revisiting my old favorites only to be disappointed, e.g., Whatchamacallit, 5th Avenue, Reese’s Sticks, and now Nutrageous. I guess some candy bars are better left as sweet memories. You know, they’re withdrawal from mainstream shelving was so subtle I never noticed! I of am stocking up on these any time I see them! Thanks for the alert. This is by far my favorite candy bar and I too have been having a difficult time finding them. I moved to California, where they seem to sell Reese’s Fast Break and Whipps, but I’ve only found a NutRageous once, in a vending machine in a hospital! I don’t love chocolate (actually I much prefer white chocolate) and my wife can’t eat it (massive migraine trigger), so Snickers doesn’t do it for me and pretty much the only chocolate bat I would buy was NutRageous. I really miss it and I hope Hershey is not dropping it from their product line.